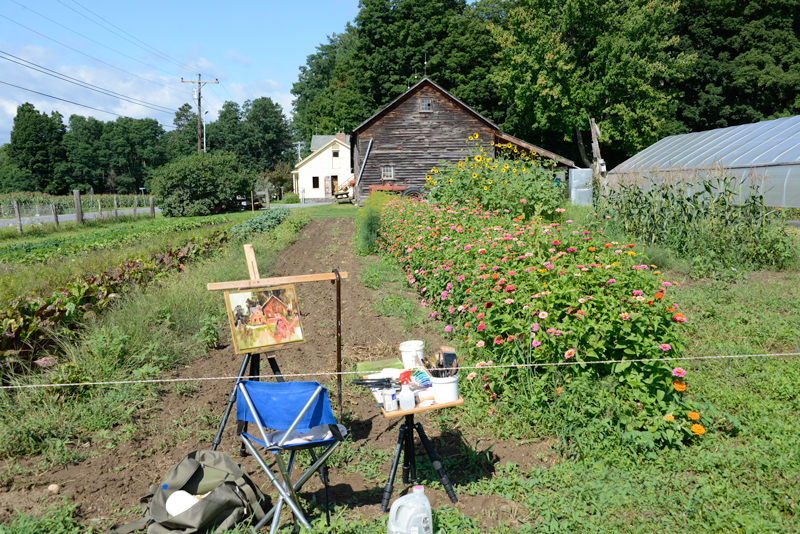 The farms and gardens throughout Vermont are bursting with bounty. Toil and love are now rewarded with an abundant harvest. 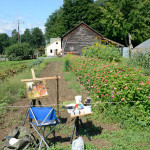 I painted this last week sitting by the Swiss Chard with a warm morning sun on my back. White butterflies danced through the air at the Old Gates Farm. And so did my brush. It’s hard to believe August is almost over but I’ll be drawing a free print winner for September next week. I use random.org to generate a random number from our Day in Vermont subscribers. 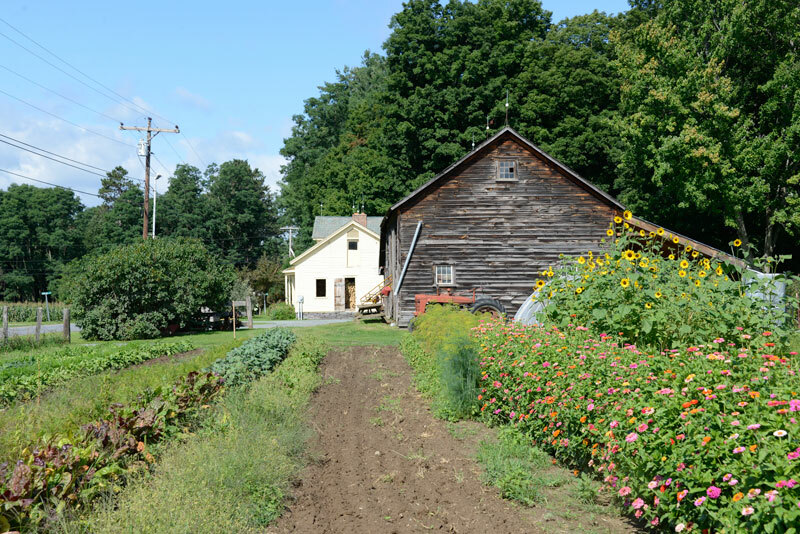 If you have friends or family that you think would enjoy A Day in Vermont newsletter too, please invite them to Subscribe. I’m a very big fan Mareva Millarc. She’s an outstanding artist with an intuitive sense of color and design. She’s also my wife. If you’re a fan of abstract art I invite you to visit Mareva’s new show at the Christine Price Gallery on the campus of Castleton College through Oct 3. Click here for more information. Peter, this is just wonderful! Where is the Old Gates Farm? It is beautiful. Thanks Arlene, the Old Gates Farm is in Castleton…just off Rt 30 on the “back way” to Castleton College. Another fabulous rendition of a beautiful VT site. Thanks Dianne, I don’t think we’ll ever run out of beauty here. O MY !!!! This one really draws me to it!!! Love the whole composition !!! Thanks very much Dhyan, this was a blast to paint for sure. 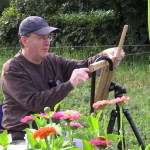 Great job Peter, I love your paintings. I know the farm well and it looks great!! Thanks for the seal of approval Dale, much appreciated! I love Mareva’s abstracts! I am not usually drawn to abstracts but hers really pulled me in. I have a small one in my kitchen that I look at and love every day . I love this painting of this farm. Thank you for sharing your paintings with all of you. Thanks Barbara, I’ll pass on the compliment to Mareva. I hope you get to see the show at Castelton. It’s a big space with quite a few paintings. Peter, As always, a beautiful painting. The farmhouse is very similar to the one my grandparents lived in many years ago. And if that is a vintage FarmAll tractor, it is like one of the first ones I learned to drive in the 70s. 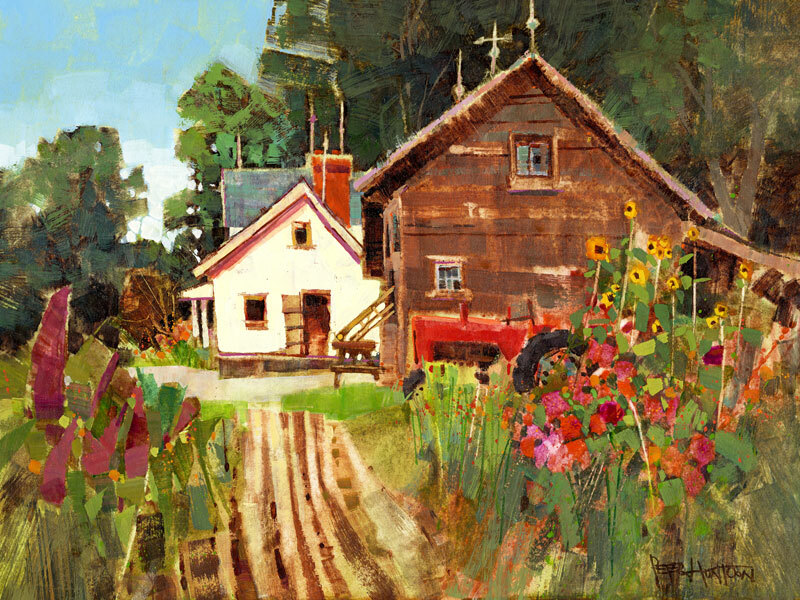 I have to admit I too was thinking about my Aunts old farm house from “many years” ago when I painted this. Back when summers, weeks and every day seemed to last forever. I can hear her wind chimes on the porch. Thanks for the big support Stephen! I know this farm well too- because it is my daughter and son-in-law’s farm. I am in Michigan so it was so wonderful to share your video with my friends. 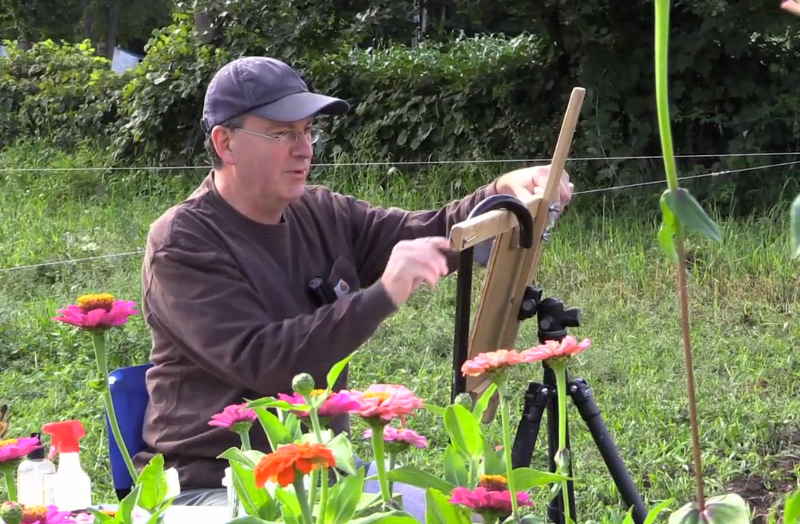 Your painting is beautiful~the video is priceless. Thank you for sharing your work. Thanks Michele for the big support, one of the best things about creating art is that it often leads to meeting nice people. I am so glad to have found this paining and video of the Old Gates Farm. 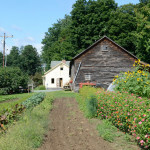 Kris, Adam and their kids have brought this beautiful farm back to life (with their hardwork and positive energy). Thanks for sharing – I especially loved watching you explore the farm looking for the “right” place to capture the essence of this farm.